Why else would he refuse to hire Boston Herald readers? Crosstown at the feisty local tabloid, the only appearance of the ad was in this news report. 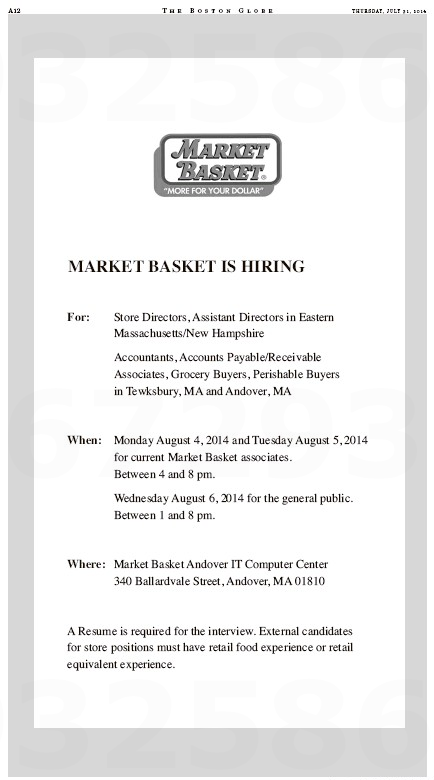 Market Basket is running ads today seeking directors and assistant directors for its stores, and accountants, accounts payable/receivable associates, and grocery and perishable buyers in Tewksbury and Andover. The fairs are open to employees seeking new positions and the public. Market Basket is running ads (note the plural), just not in the Herald. So Market Basket does not want to hire Herald readers? That just seems wrong. 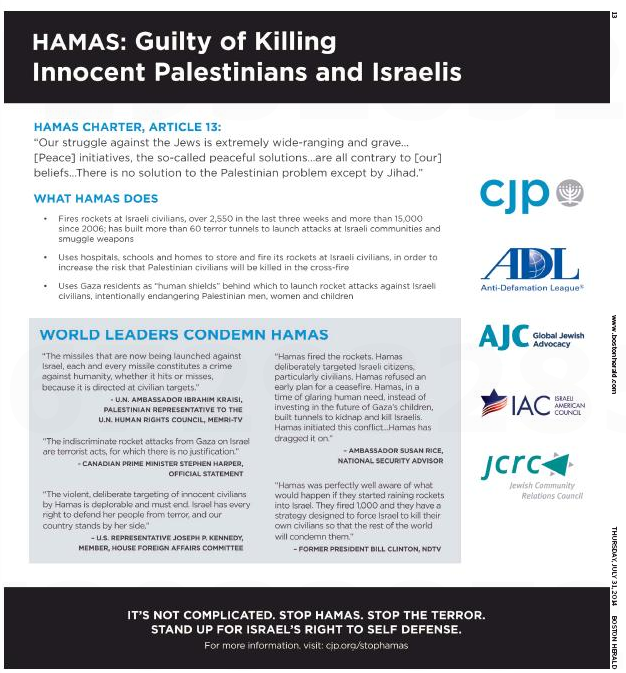 The thirsty local tabloid did, however, get a consolation prize – this ad from an alphabet-soup coalition attacking Hamas. Even that was bittersweet, though. As the hardreading staff noted, the Globe had the ad a week ago. As the hardreading staff noted earlier, yesterday’s Boston Herald got the better of the Globe in the Boston dailies’ coverage of the Demoulas Slapfight/Market Basket Rumpus. But today, the stately local broadsheet was on the story like Brown on Williamson, with four – count ’em, four – pieces on the grocery-store equivalent of mutually assured destruction. Start, of course, with Page One (the Globe ePaper is Lost in Cyberspace right now, so no screenshots for you!). Negotiations over the fate of the embattled Market Basket grocery chain stretched into a second day Tuesday, as the company’s board said the owners were evaluating a sale to help rescue the multibillion-dollar business. As analysts warn that the value of the company falls and the threat to workers’ jobs rises with each day of indecision, the board said it was still considering offers by ousted president Arthur T. Demoulas and other suitors. People familiar with the talks said Demoulas’s offer was the focus of discussions throughout the day. And Market Basket is the focus of the Globe throughout today’s paper. Drifting back to the Business section we find Shirley Leung’s column about other grocery families that struggled with ownership, Jack Newsham’s piece on Market Basket loyalists shopping at the competition, and a look at social media by Callum Borchers and Andrew Ba Tran, complete with nifty graphic. It should be no surprise that in the digital age Facebook has served as the center of the Market Basket protest movement. But just a few short weeks ago, many of the employees leading the fight barely knew their way around the Internet. Until recently Market Basket didn’t have an official company website. It quickly crashed and is still not working. Managers have company e-mail accounts but use them sparingly. When you work in a supermarket, the colleague you need to talk to is never more than a few aisles away. “Technology is not part of our company culture,” acknowledged Tom Gordon, who was a a grocery supervisor at market basket for 39 years before being fired in early July for helping organize the protest. “I’m still using my flip phone, if that’s any indication. Yet a Facebook page called Save Market Basket has become the hub where workers lay out the next course of action to get their ousted president, Arthur. T. Demoulas reinstated, post news articles and letters from the company’s board of directors, and where tens of thousands of customers have pledged their support. feels like there’s no bottom to this well, doesn’t it? Monday’s local dailies both featured the obligatory quotidian update on the Demoulas Slapfight/Market Basket Rumpus. With a multibillion-dollar supermarket empire hanging in the balance, the Market Basket board of directors met Monday to again consider a buyout offer from Arthur T. Demoulas but agreed only to continue negotiating, according to a person briefed on the discussions. Demoulas had previously set the end of Monday as the deadline for rival members of his family to respond to his offer to buy their half of the company. The board’s continued negotiations will keep Demoulas’s bid on the table for now, according to the person familiar with the discussions, but both sides are facing pressure to resolve the family feud that has paralyzed the 71-store chain and caused tens of millions of dollars in losses. Among those pressures: a total revolt by Market Basket store managers. Meanwhile, managers of some stores signed a petition stating that they would resign unless Arthur T. Demoulas is reinstated as president of Market Basket or if the company is sold to an outside buyer. It was unclear how many managers had signed the petition Monday night. Excuse us – it was not unclear to the Boston Herald. Market Basket managers have reaffirmed their commitment to working for nobody else but fired CEO Arthur T. Demoulas, saying they’ll quit if he isn’t reinstated — a threat that could remove the working management of most of the chain’s stores, already reeling from a loss of customers and protests by thousands of workers. Managers and assistant managers from 68 of the Tewksbury chain’s 71 stores had signed a petition by yesterday evening stating they would resign immediately if Demoulas isn’t reinstated “with full authority” or another buyer other than Demoulas purchases the company, according to Steve Paulenka, a former Market Basket facilities and operations supervisor who was fired July 20 for helping spearhead employee protests and job walk-offs. So who’s doing a better job of bagging this story? 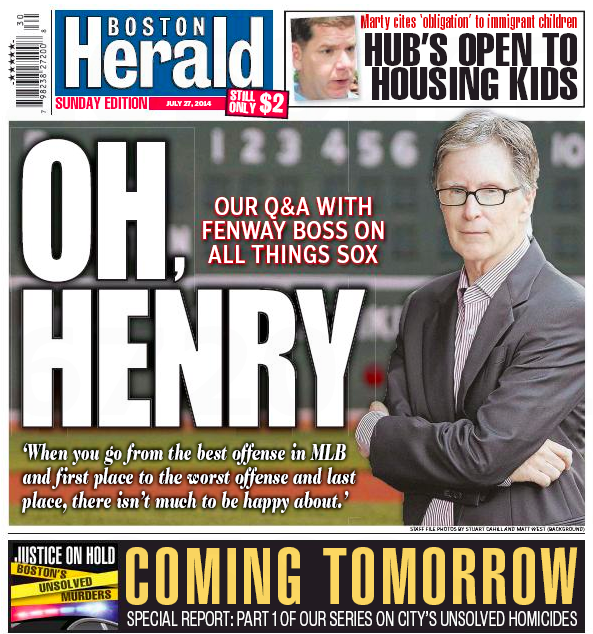 The Boston Herald’s Michael Silverman got an email interview with Boston GlobeSox owner John Henry, which, of course, was Page One news for the feisty local tabloid. The email exchange between Silverman and Henry was pretty much what you’d expect. The Red Sox are genuinely perplexed. The reasons behind the team’s incredibly underwhelming and disappointing caliber of play for most of the first four months of the season are not clear to Henry and the front office. 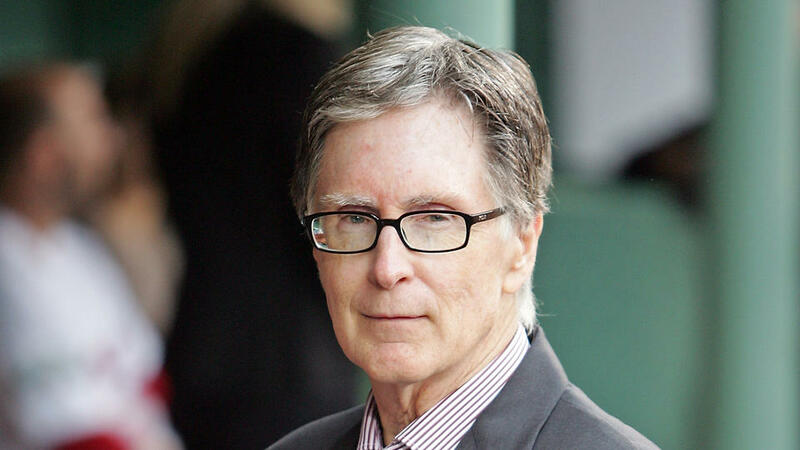 With the trade deadline looming Thursday, Henry and his baseball operations people have been trying to get a better handle on what’s gone wrong and discover if there’s time left to fix it. But there is one juicy item in the piece: A not-so-veiled reference to this from Boston Globe scribe (and Henry employee) Dan Shaughnessy last Sunday (reproduced in full for, well, full effect). When did Boston go so soft on the Red Sox? The Sox were positively surging with five wins in six games against terrible/mediocre teams (aggregate 21 games under .500) as they prepped for the Royals Saturday night. The KC-Boston matchup is a good one, since it sometimes sounds like the Sox want to be a middle-market team. Like the Royals of recent decades (29 years since making the playoffs), the Sox now sell the fans on “watching the kids.” Don’t people realize that EVERY team has a farm system stocked with young players who’d love to play in front of sellout crowds in the moribund final months of a season? It amazes me how soft this baseball market has become. In 1978 fans and media crushed the Sox for a 99-win season that concluded with eight consecutive pressure-packed victories. The Boston manager was unmercifully booed on Opening Day the following year. Now everything is awesome because the Boston ballpark is a tourist destination and fans fall in love with the hype of every young player coming through the system. Swell. When did we become St. Louis? Ouch. The only thing Shaughnessy left out? That the principal owner of the GlobeSox etc. etc. “Fans continue to sell out Fenway. They’ve suffered through some really bad games this year, but they continue to show up and the mood at the park among the fans is very positive when I walk through the stands. Before Tom [Werner], Larry [Lucchino] and I arrived I believe fans had less patience. Love that double negative. Wonder what Mr. Shaughnessy thinks. Now that former probation commissioner John J. O’Brien has gone down like the Hindenburg, the local dailies have begun patting themselves on the back in earnest. The federal prosecution was based in large part on a 2010 Boston Globe Spotlight series that exposed widespread patronage hiring in the Probation Department, which oversees defendants facing charges in a criminal court and mediates disputes in family courts. That’s some serious glory-grabbing by the heisty local tabloid, eh? 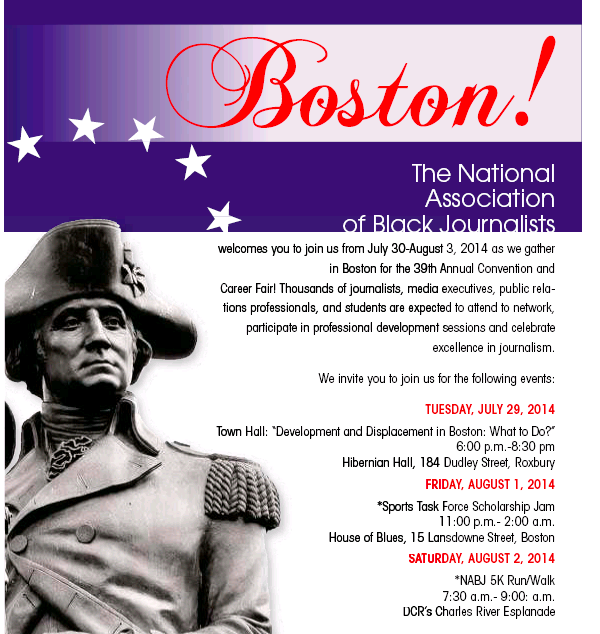 The NABJ Is Coming! 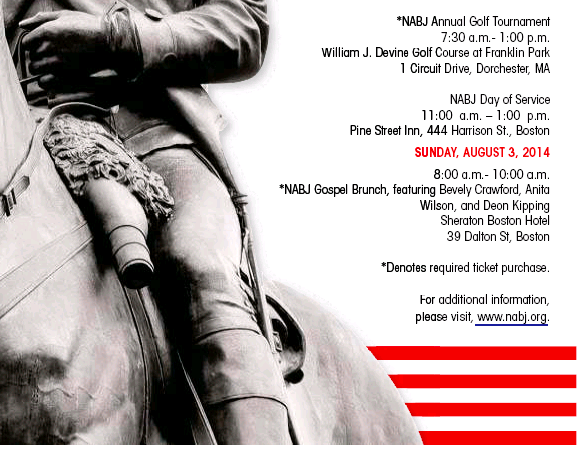 The NABJ Is Coming! Once again, ad-vantage, Boston Globe. From today’s Sports section comes this ad for the 39th Annual Convention and Career Fair of the National Association of Black Journalists (in two parts for legibility). Looks great. Except . . . George Washington? Really? Or is it just me? You are currently browsing the It's Good to Live in a Two-Daily Town blog archives for July, 2014.